On Thursday, November 29th, 2011, Michelle Hickman, a Houston mom, was shopping at her local Target when her infant woke up, hungry. Michelle sat on the floor in a remote area of the store in the ladies clothing department and began breastfeeding her baby, using a blanket as a cover. A couple of Target employees came and asked her to move. One of them stated that Target employees had been trained to ask nursing moms to move into fitting rooms to feed their babies. Michelle explained her legal right to feed her baby anywhere to them but was still asked to move to a different spot and one of the employees even suggested she could receive a ticket for indecent exposure. Michelle stated that there were another 3-4 employees who did not approach her verbally but gave her mean looks and shook their heads at her. "For guests in our stores, we support the use of fitting rooms for women who wish to breastfeed their babies, even if others are waiting to use the fitting rooms. In addition, guests who choose to breastfed discreetly in more public areas of the store are welcome to do so without being made to feel uncomfortable." Jessica Clarkson, from target Media relations, who sent Bettina the response. also stated that they continually educate their staff regarding said policy and that they have worked with Michelle Hickman to resolve the matter. According to Michelle, she never received a follow-up or apology. 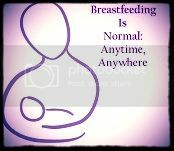 Therefore, breastfeeding mother's around the country decided to proceed with the nurse-in in support of Michelle. The plan was to show Target how many nursing mothers shop there and why they should enforce their policy. Although it was only the two of us, I feel proud to have been a part of helping to normalize nursing. The nurse-in ended up being a big success nationwide. Moms nurse their babies in over 250 stores across the countries with some of those locations, including the one in Houston where Michelle Hickman was harassed, having over 50 moms show up. Many dads, friends and other breastfeeding supporters showed up as well and, in some locations, news crews showed up to cover the event. Target never apologized to Michelle Hickman for the way she was treated and the only statement they've made so far is re-stating their corporate policy and assuring the public that they welcome breastfeeding moms in their stores. I hope, for their sake, that this is true, that they truly train their employees and enforce the policy, and that this is the last of these incidents. the power of nursing moms was demonstrated on December 28th at Targets across the nation and it would be unwise for target to alienate such a huge number of customers. Although no apology has been made, the nurse-in did attract a lot of media attention. I consider the nurse-in successful in this aspect because it has served to raise awareness of breastfeeding and how nursing moms are being treated in many public locations as well as bring the issue to the attention of the mainstream media. Hopefully the media attention will help bring about some much needed change. You can read Michelle Hickman's statement to the Best for Babes Foundation here. Also check out Target's response to Bettina Forbes from the Best for Babes Foundation here.